Boeing (Chicago) and the Lion Group (Lion Air) (Jakarta), Indonesia’s largest airline group, yesterday (November 4) commemorated the delivery of the carrier’s 100th Next-Generation 737 at a special event. 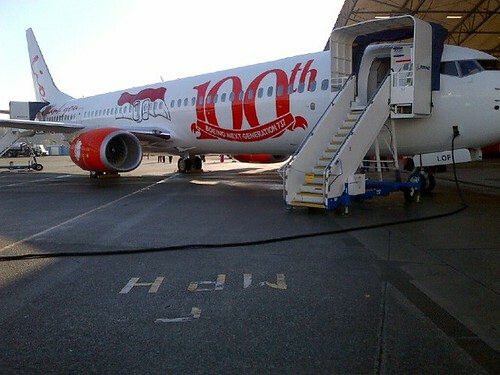 The Lion Group’s 100th airplane, the pictured Lion Air 737-9GP ER (Extended Range) PK-LOF (msn 38741) features a special “100th Boeing Next-Generation 737 – Thank You Indonesia” livery commemorating the delivery. 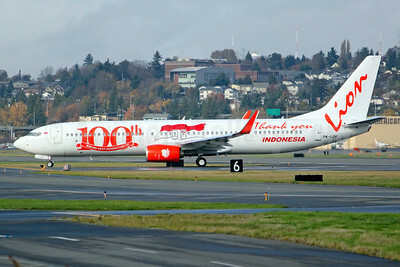 Lion Air, which was established in 1999, was also the launch customer for the 737-900 ER. Lion Air mainline currently operates 67 737-900 ERs and 19 737-800s. The group’s other Next-Generation 737s are allocated to its full-service carrier in Indonesia, Batik Air, and to its overseas affiliates: Malindo Air in Malaysia and Thai Lion Air, a new carrier based in Bangkok. All of the Lion Group’s new 737 deliveries feature the Boeing Sky Interior, the 787 Dreamliner inspired cabin. Lion mainline and subsidiary Wings Air serve 76 destinations in Indonesia, giving the group the largest domestic network in Indonesia. Lion Air mainline has 580 flights a day and Wings Air has 180 flights per day. Top Copyright Photo: The Boeing Company. Bottom Copyright Photo: Joe G. Walker/AirlinersGallery.com. This entry was posted in Lion Air, Lion Group and tagged 38741, 737, 737-900, 737-900ER, 737-9GP, BFI, Boeing, Boeing 737, Boeing 737-900, Boeing Field, Lion Air, lion group, PK-LOF, Seattle on November 5, 2013 by Bruce Drum.